Scientex has been appointed Distributor for Solida Biotechnology (Germany). The range includes bench and pilot scale systems. The management and engineering team has depth of experience in fermentation, cell culture and renewable applications to form the basis of continuous products development. All of Solida Biotech’s bioprocess equipment meets the latest GLP, cGMP, GAMP, FDA and SFDA standards for worldwide distribution. Solida Biotech is pleased to announce its state of the art, next generation range of benchtop bioreactors and fermenters in the Bio Bench Pro Advanced series as well as the user-friendly Bio Bench Compact version. All Bio Bench bioreactors and fermenters integrate modern, open-source industrial technologies with a unique concept of intelligent modularity, expandability, and robustness. All Bio Bench bioreactors and fermenters feature industrial design with stainless a steel front, back, and utility panel. All modules are connected to the master controller through industry standard Ethernet communications protocols, while the modular design enables users to configure the systems according to own lab space needs within the most compact footprint. Solida Biotech offers a complete range of pre-assembled pilot SIP (in situ sterilisable) bioreactors and/or custom made solutions based on detailed customer requirements. BioSip automation & software are based on leading supplier PLC’s that runs under an advanced intuitive operating system. Software comprises a PLC with local visualization platform, human interface (HMI) touch screen and custom made configuration. 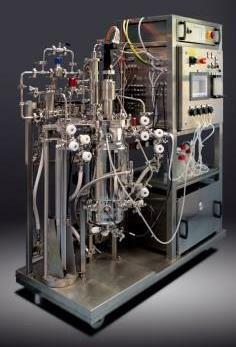 BioSip Controller architecture can hold and simultaneously manage up to 2 or more Lab and Pilot bioreactors. Automation design and functionality allow the interchange of vessel’s size without modifying PLC or Software configuration.